Temple Croesus has won over £33,000 show jumping internationally including the Royal International, Hickstead, HOYS, Olympia, He has competed at all levels to name a few AON’s, IT’s, A&B’s, AT’s, 1.40m, 1.50m and 1.60m, Grand Prix & Puissance competitions. Winning the 1.60m at the Royal Show in 2003. This stallion has it all, he is a grade A Silver Elite stallion. Proving he has performance, of a top sports horse & the conformation and level head to pass on to his you stock winning country working hunter, show hunter and side saddle. His sire Caletto I was twice winner of the Grand Prix of Aachen and numerous other Grand Prix. 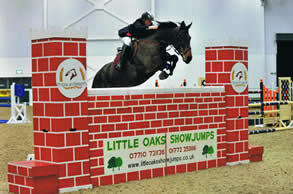 He was German Team Bronze Medallist in the European Championships in Hickstead. Caletto I was not only a performance horse and a producer of performers but a sire of 21 approved sons. His daughters produced 9 approved sons. He is a star in Holsteiner breeding. Caletto I’s sire is the world-renowned stallion Cor de la Bryère, a leading sire of performers in all three disciplines. He is considered the father of the modern show jumper, producing fifty approved sons standing worldwide. FVS Hercules Million’s dam Louella Million is by RIBBLESIDE GRANDI V AES and Weatherby's registered and Licenced British Bred Hannovarian stallion. Outstanding sire of top quality youngstock, with progency competing to a high level in a variety of disciplines. Already a proven showjumper himself he also made his showring debut in 2010 with countless wins throughout the North West. Standing at 16.1hh and carrying top class German lines on his Sire's side - spangles / Grannus. His mothers ORPHEAN ANNEY also contains top class breed lines, she herself qualified for the Foxhuter final and was sired by multiple international showjumping champion Didi. Louella Million Great gransire Grannus - not just a name but a symbol, a trademark. A symbol of a potent individual with an aura only a very few are blessed with a lifetime total of well over five million DM so far the off-spring of this glossy black Hanoverian stallion which include seven Olympic horses and more than 60 approved stallions, have made him one of the greatest sires in the world. Just as powerful as his inheritance is, his end was just as spectacular. In full view of several thousand spectators at Klatte's 1993 Stallion Presentation in Vechta, the heart of the Oldenburg breeding area, the 21 year old muscle man suddenly fell to the ground - the last breath of an equine personality seldom seen. 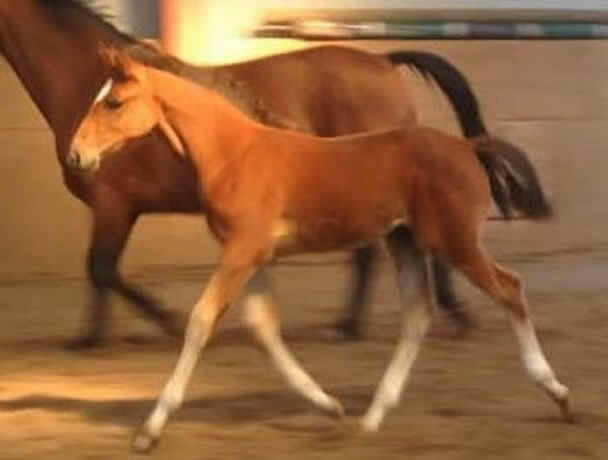 Grannus was State Premium Odessa's second foal.